Now that Thunder Mesa has progressed to the point where I know exactly how much real estate the expansion will take up, it got me thinking about a small, empty corner just across the aisle. 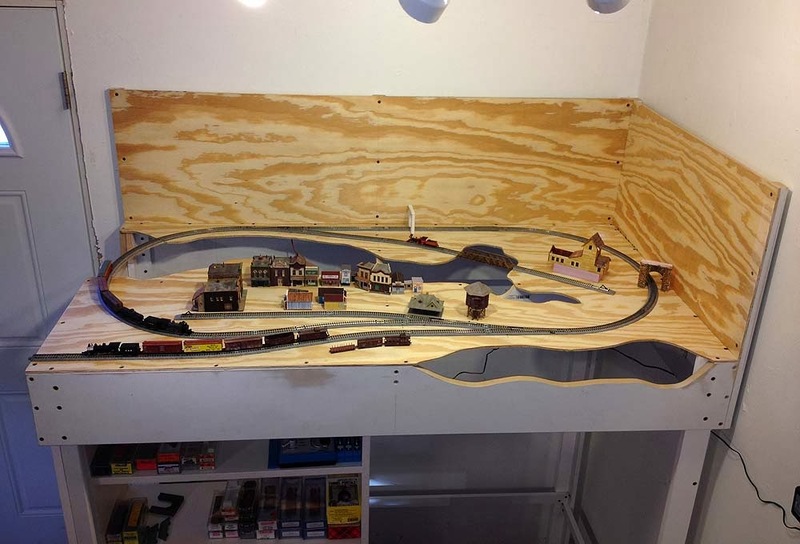 I still have a lot of stuff in storage from my old N scale days and it occurred to me that there might be just enough room there for a small N scale layout. Two days and a great deal of wood butchery later, the Pagosa & Southern was born! 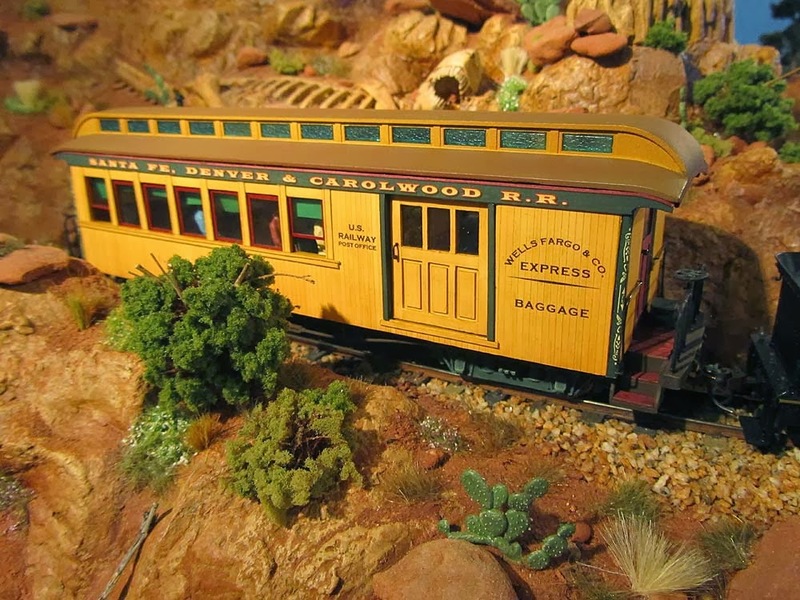 The Pagosa & Southern, an N scale layout in just 32" x 60". I'm using Kato Unitrack on this one for a couple of reasons: 1) It operates really well, and 2) I have a bunch of it on hand. 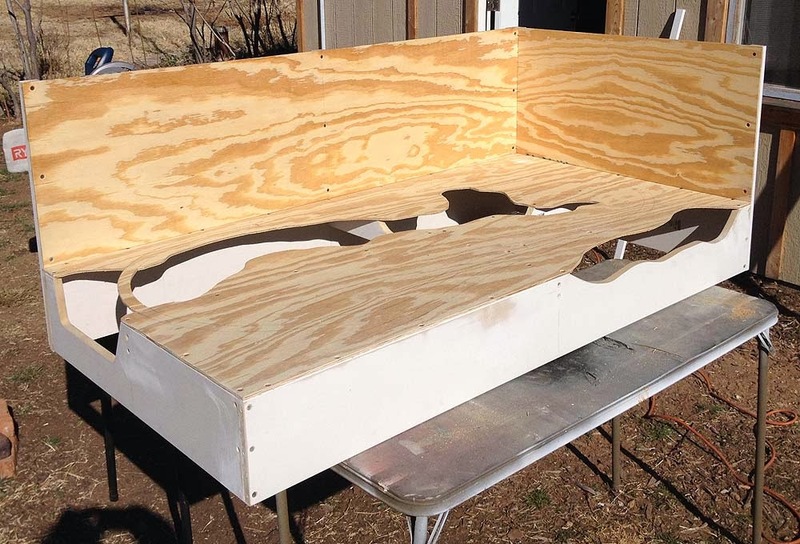 The layout measures just 32" x 60" and is built with dimensional MDF board and 1/4" plywood. Track level is about 56" above the floor, a bit higher than the Thunder Mesa layout, with loads of room underneath for shelves and storage. The track plan is deliberately simple. A mainline upfront acts as a staging track to bring trains onto the loop. Two additional sidings offer a little switching variety. Control is standard DC from a Kato power pack. The turnouts route power, making it possible to have up to three trains on the line without the need for complex wiring. 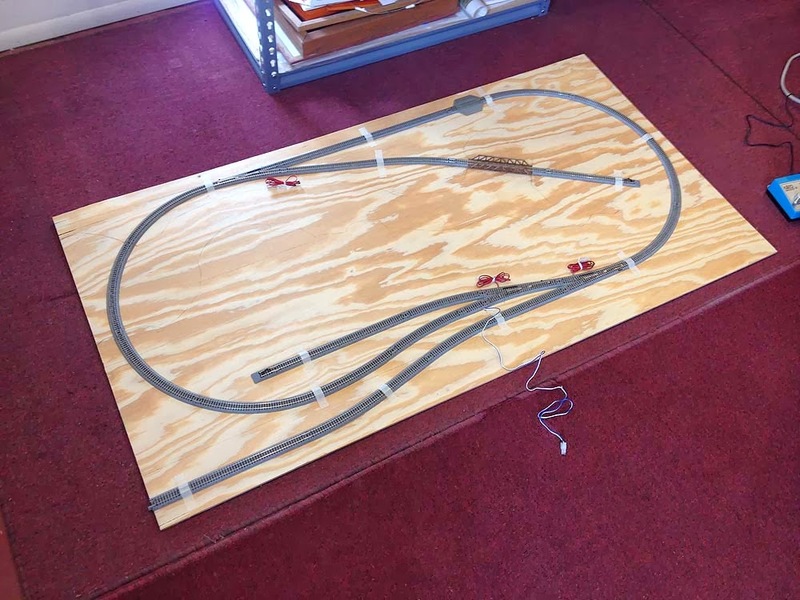 The track plan was laid out on a 32" x 60" sheet of 1/4" plywood using Kato Unitrack. The track was taped down and then outlined in pencil on the sheet. The locations needed for turnout and track wiring holes were also marked. 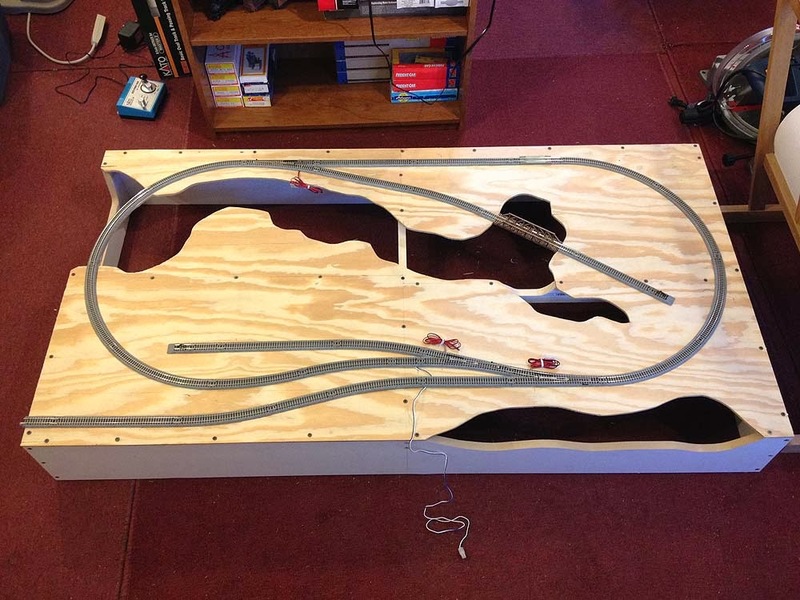 The completed table top with track in place. The box was built from 1" x 8" MDF. Wood glue and drywall screws hold everything together. A deep canyon will separate the layout diagonally. Backdrop supports were created using leftover 1/4" plywood and 1" x 2" MDF. The actual backdrop will be a photo print laminated to this surface. 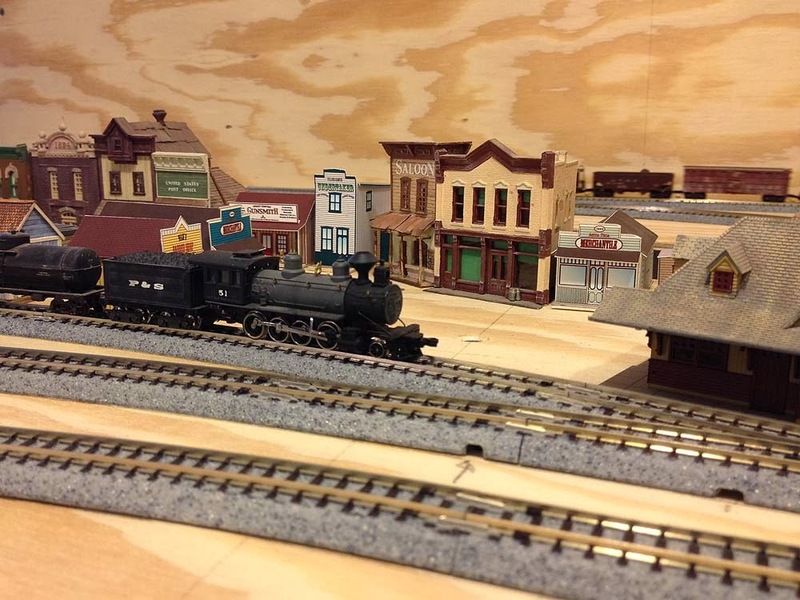 I couldn't resist digging some old N scale structures out of storage and placing them on the layout. The locomotive is a fine running 2-8-0 Consolidation from MDC/Athearn. I lettered it for another layout with the initials "P&S" long ago and that lettering inspired the name Pagosa & Southern. The P&S in place in my studio, across the aisle from the On30 TMMC. The 56" tall supporting legs are L-girders made from MDF. All controls are located on a shelf below. 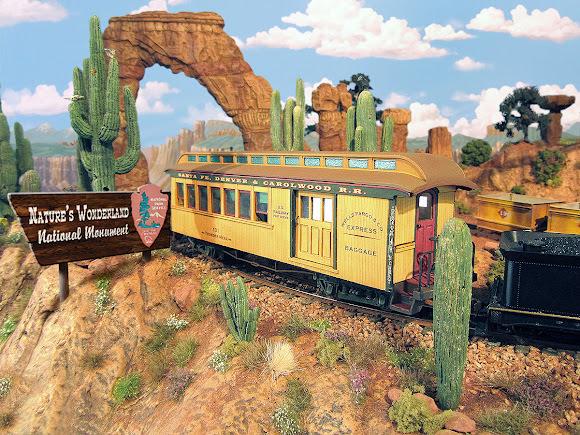 As the name suggests, the Pagosa & Southern will have a southern Colorado, San Juan Mountains theme. The era will be the early 1950s, representing a line that was originally built as narrow gauge and later converted to standard. If you look closely, there are a few Nn3 cars in the photo above and they will be parked on a non-operating bit of track to help represent this history. 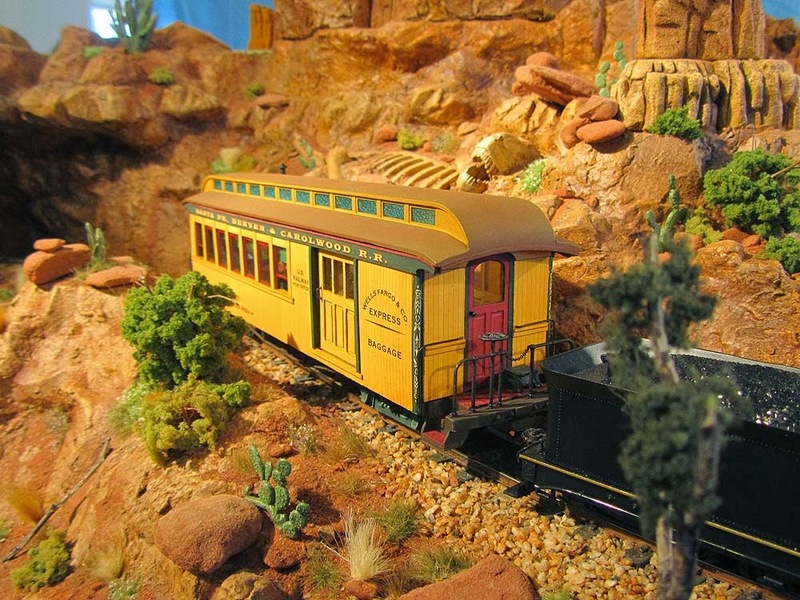 The rear spur track will serve a classic, Colorado style sliver mine. 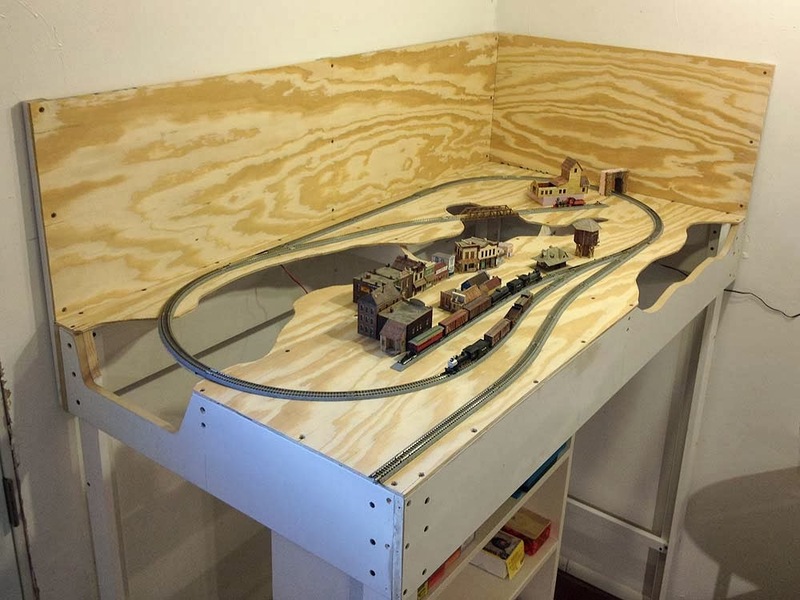 I'm sure that some may object to the lack of operating potential on this little layout but the point here is primarily display and an excuse to build a bunch of N scale kits I have that are gathering dust. I don't want a big N scale pike (been there, done that), but I do really enjoy the charm of watching these little trains go round. Across the aisle on the TMMC, a bit of progress continues. I ended up taking a longer than expected two month hiatus from the layout but the train bug has bit again and more progress on the layout expansion and other projects will be coming soon. 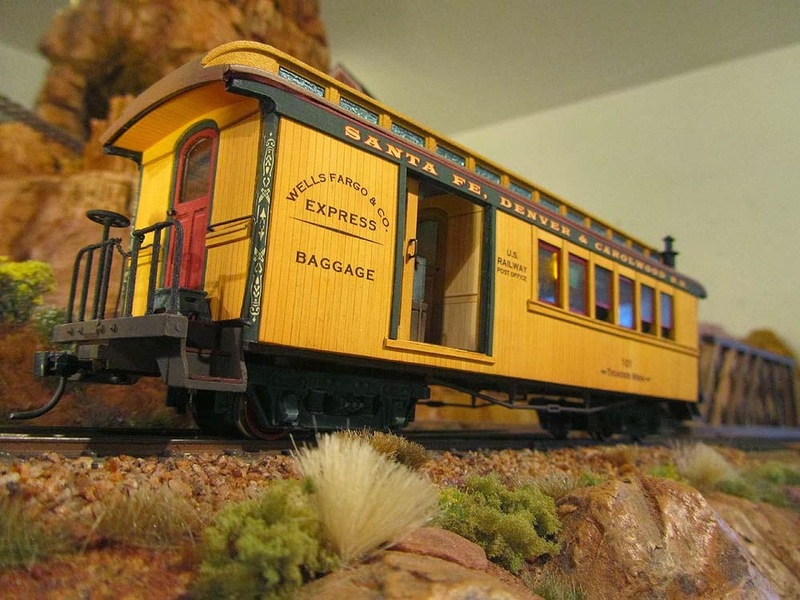 In the meantime, here's a look at my latest On30 project, a combination baggage/passenger car mostly scratch built with a Bachmann frame and roof. I wrote an article for the 2014 On30 Annual detailing the car's construction and its Disneyland inspiration. More details on that after the magazine comes out. Thanks for checking in. Adios for now!